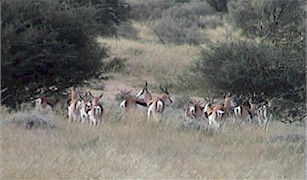 Game viewing from an open vehicle that we provide or your own 4X4. 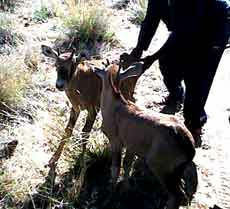 You can discover the beauty of nature under the guidance of people with superior knowledge of the Kalahari and nature. Unlimited hiking and horseback riding opportunities are available. Night drives with spotlights provide the opportunity to discover the hidden beauty of nocturnal animals. 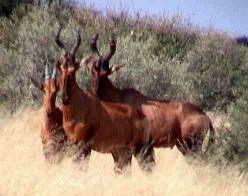 Your guide will provide you with interesting information concerning the total ecology of the Kalahari. A Secretarybird [Sagittarius Serpentarius] walks away after quenching its thirst. Several species of predatory birds breed on the farm and can be seen. 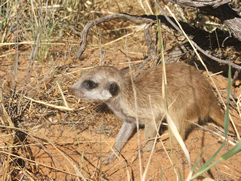 From birds like Secretarybird, Tawny eagle, Giant eagle owl, Martial eagle, Bateleur, Blackbreasted snake eagle and Pale Chanting Goshawk to Pygmy falcon and Pearlspotted owl, can be seen. A feast for bird watchers ..... up to 100 species to be seen in their unspoiled environment. 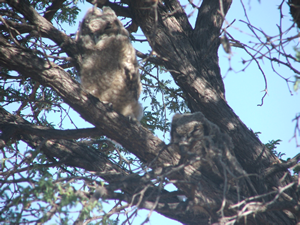 Two little spotted eagle owls. 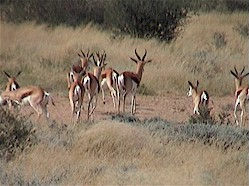 A few springbok walk away from a salt block.